I am not sure if this is the right place to post this. 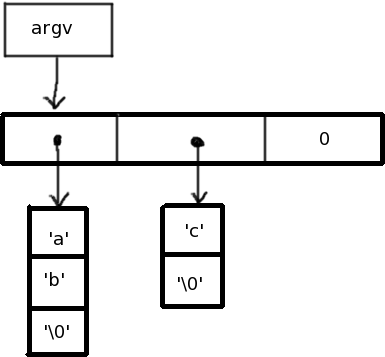 Where the char uses two pointers and also, it's not in the name "argv" but rather directly following the char which also confuses me. Am I just simply stupid and should I just give up? Anyway, please help me understand. Thank you. 9 months, 3 weeks ago Edited by Alex Baines on June 27, 2018, 9:51 p.m.
You're correct that & gets the address of a variable. 1. You want the function to modify the variable. But you can work around this by passing a pointer to the variable - func can dereference the pointer to get a modifyable "lvalue". 2. You're passing a big struct and don't want all that memory to be copied onto the stack frame. Since everything is passed by value, if you have a struct with 100 uint32_t's inside, that's gonna effectively do a 400 byte memcpy every time you call the function. If you pass a pointer to the struct it'll probably do no copying at all, because the pointer can be passed in a register. 3. Combining 1 and 2, you have a struct and want the func to modify some of its fields. As for argv, it's an array of character pointers. And since arrays in C are closely related to pointers (and you can't pass a plain array as an argument - they "decay" to pointers), argv appears as a "pointer to pointers to char". Also whitespace between the *, typename and identifier doesn't matter, it's personal preference whether you use "int* a", "int *a", "int * a" or "int*a", though the last two are ususal. Thank you so much. One last thing, how come you have to specify that the arg inside the function is a pointer when you did that within the parenthesis? The * inside the function is not specifying that arg is a pointer, but it's used to dereference the pointer, so that the thing you're adding 4 to is the variable whose address is stored in arg. If you did arg += 4 without the asterisk, it would add 4 to arg itself, meaning arg would point to an address "4 ints further" in memory, that is, assuming type int occupies 4 bytes, you would then point to an address 16 bytes after the location of variable a. C follows a syntax idea known as "declaration follows use". It's a neat idea--C is old, and they were still figuring out how best to do languages then--but it does cause confusion like this. I think everyone gets confused by this at one point. *arg appears in both places, because the fact that the expression (*arg) gives an int determines the syntax in the declaration. C++ programmers, who as a rule try to be more modern in their thinking, think of the arg argument as having the type "pointer to int". So, they put the asterisk with the type. This explains the array declaration syntax, too. The array is with the type, not the variable name. Newer languages think: you have a variable, its an array, it has a type sized-array-of-sub-type. C thinks: theres a big load of type somewhere, here's how you get at them.